My first review of 2017 is a Christmas novella, as although we are back from visiting family, the decorations are down and Ed is back to school; I’m not quite ready to let go and move on just yet. 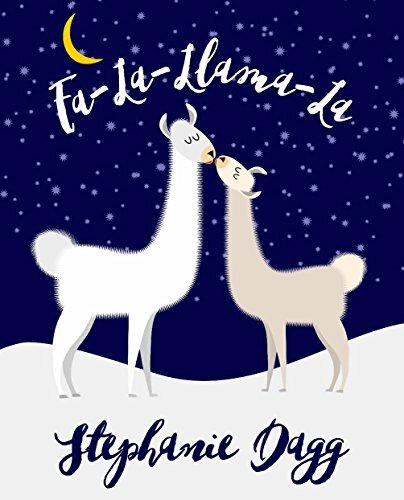 Fa-La-Llama-La by Stephanie Dagg maybe set in sub-zero temperatures but it left me feeling warm on the inside. Noelle arrives in rural France, in a snowstorm, a few days before Christmas, hoping the last minute pet-sitting project will help her struggling finances. However, although the llamas waiting for her are just as lovely as her quick Internet research led her to believe they would be, nothing else is quite what she was expecting. There is no power, no water and aside from the llamas, the company, to begin with, is rather difficult. The sensible option would be to leave as quickly as the snow will let her, but with nowhere to call her own, she opts for the adventure. Amid the snow, strange goings on seem to become normal, the nativity comes to life and with it there is a hint of romance in the air. This book is a warm feel-good read that picked me up on a lonely weekend when I was at a bit of a loose end. Stephanie’s way with words and fun with accents made me laugh and I’m sure other word nerds will be just as entertained as I was. I could have stayed longer, but it finished. You can read my review of Stephanie’s memoir Head’s Above Water here and my France et Moi interview with her here. I’m looking forward to reading more from Stephanie.